The attraction of the superhero film or young adult series is not just the existing brand name recognition or well-tested concept and characters, it’s the mythology. Not from the rich themes or complex character relationships it offers – though these are often happy side effects – but from the long-form plot development to feed sequels with. It frees filmmakers and executives of the difficult task of coming up with new story ideas for characters which won’t accidentally alienate the fans by moving too far from the original. Film series without that luxury instead have to take whatever they started with and try and give audiences similar thrills with each succeeding chapter while simultaneously finding new depths to the material. This usually requires twisting the original concept out of all recognizable shape (or sense) in order to find new ways to do the same old thing. Case in point: F. Javier Gutiérrez’s Rings, a sequel in a search of a reason to exist. The original Ringu, and more specifically Gore Verbinski’s American remake, was a moody thriller with a decently thought out backstory which it melded with its thrills to just the right extent. It also lent itself well to endless, uninspired sequels, which is pretty much what we’ve gotten. All anyone has to do is watch a copy of the infamous video and the fun starts all over again. Finding a way to expand on that while also expanding on those elements, however, requires more material than the original film offered up and a greater appetite for risk than its producers have shown. Someone who does have such an appetite is young college student (and Dave Franco lookalike) Holt (Roe), who agrees to participate in a shady college professor’s (Galecki) experiments with the original video. When Holt disappears, his plucky girlfriend Julia (Lutz) follows him into the bowels of the experiment, discovering first-hand what happens when someone watches the strange video. Desperate to get the curse of the video off their back, Julia and Holt trace video phantom Samara (Morgan) back to its roots, looking for clues in where she came from to figure out how to dispel her. Finding a dark history previously unknown, they follow her real family tree to a sleepy town trying to forget the strange girl who lived there or the mystery of what happened to her real parents. 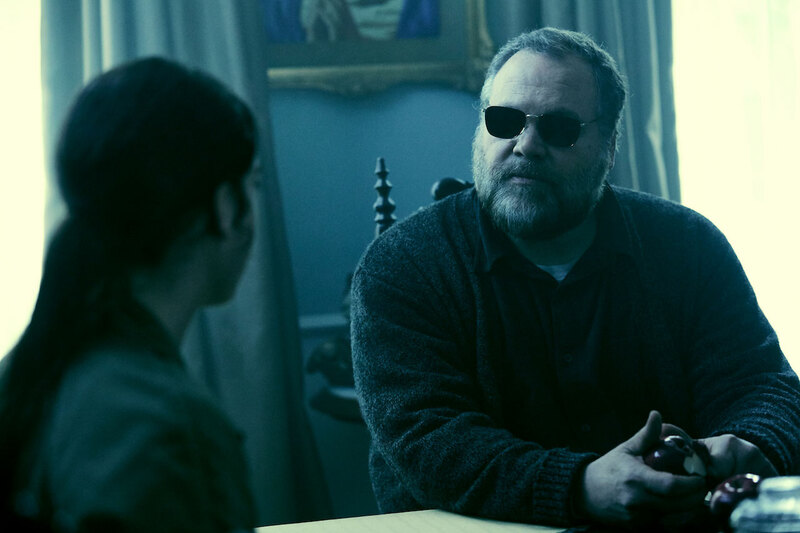 The only one who might help them is a blind cemetery groundskeeper (D’Onofrio) who seems to know much more about Samara – and her strange relationship to Julia – than he will admit. Like a lot of these kinds of films, Rings finds mystery investigation the easiest way to eat up its running time in-between tension moments. This requires the audience to never have seen one of the previous films (making a lot of what happens incomprehensible) or to have a fuzzy memory of it so that familiar ground can be re-trod. Once again Samara climbs out of a television to attack a helpless individual. Once again the young couple in the crosshairs travel to Samara’s home town to unearth her past and perhaps get her to stop killing people. In between are a lot of young actors yelling things incomprehensibly at one another and squinting through dark cinematography from Sherone Meir (Whiplash) favoring dank greens and greys like the film was decomposing before us. 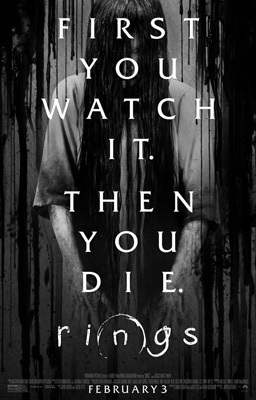 Rings travels at a breakneck pace, probably to keep the audience from asking how any of its increasingly-implausible revelations square with what has come before. This would probably work more if it didn’t spend every moment of its second half begging viewers to remember what has come before in a textbook example of how to do ‘you never knew the whole story’ wrong. Gutiérrez constantly returns to successful elements from the first films, but they’re so well-known now they have no power. Instead, he primarily highlights how pale a reflection the new elements he introduces – like a new, expanded killer video – are compared with the original and how bad an idea it is to continue delving into backstory rather than forging ahead with something new. Rings is like a copy of a copy of a copy of an old video tape; garbled, faded and impossible to watch.